Dean Hammond has criticised suggestions that League One lacks quality this term. 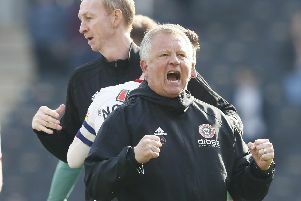 The Sheffield United midfielder, speaking ahead of tomorrow’s game against Peterborough, branded the claims as disrespectful and warned they risk undermining the South Yorkshire club’s hopes of returning to the Championship next summer. Some commentators, predominately those on social media, frequently describe the competition as a “pub league” following the departure of clubs such as Wolverhampton Wanderers and Bristol City in recent seasons. Hammond, on loan from Leicester City, is adamant United’s decision to tweak their tactics after experiencing a disappointing Autumn period not only reflects the division’s depth of talent but the ability within Nigel Adkins’ squad too. They enter the meeting with Peterborough searching for a fifth consecutive win.